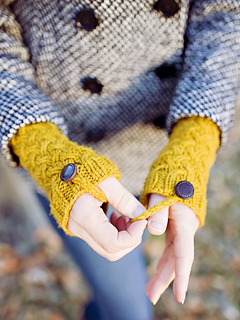 Fingerless cuffs with a slipped stitch cable pattern and moveable thumb divider and decorative button. 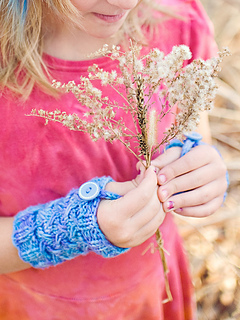 The i-cord thumb divider can be worn to the side or positioned to hold the cuffs in place. Directions are given for 5 sizes to fit kids and adults. Check out my Farro Hat pattern for a coordinating set. 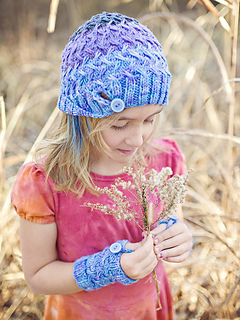 Purchase both the Farro Hat & Cuffs patterns and receive a $2 discount! No code needed and purchases do not have to be made at the same time, the discount will be automatically applied any time the second pattern in the set is purchased. 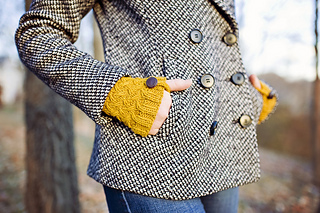 CIRCUMFERENCE: Cuffs are intended to be a snug fit on a palm circumference of up to 5 (5¾, 6½, 7¼, 8)”. Measure around your palm above the crook of your thumb to find your size. 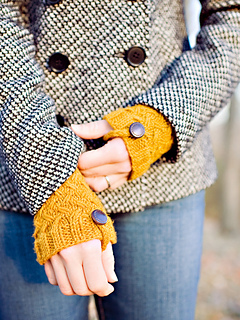 YARN: Approximately 70 (90, 130, 150, 170) yards of worsted weight yarn. Sample was knit with Dream in Color Classy (100% Merino 250 yards / 113 grams per skein) in Amber Glass. NOTIONS: 2 buttons of any size, a darning needle for weaving in ends. Cable needle.